What are the advantages of using groundwater? Many people rely on water from rivers, streams, lakes and ponds (surface water) as their only source of drinking water. Because surface water is often contaminated, it should not be used for drinking unless it is treated first. The best alternatives to surface water are to use groundwater or to collect and store rainwater. Groundwater is usually free of germs because it is filtered when it seeps through sand and soil. However, groundwater can be contaminated by natural minerals such as arsenic, by leaking sewer pipes, septic tanks or latrines, by waste dumps, or by industrial chemicals. The most serious threats to groundwater are poorly built sanitation systems (latrines), waste disposal, deforestation, overgrazing, industrial pollution and over-use. Deforestation and over-grazing affect the groundwater because more water runs off the bare soil into rivers, instead of soaking into the soil and adding to the groundwater. So we need to look after the groundwater. What can be done? The best way to protect groundwater or surface water is to protect the entire area where water collects, called the catchment area. After a water source is developed, more people tend to gather in he area, making it harder to protect the catchment area. Industry and farming use — and pollute — much more water than the amount used by people for their daily needs. This threatens the safety and availability of water for household use. In places with a lot of industrial activity, water may be over-used or polluted and the people who need it most may not have the power to prevent the problem. Both of these problems can only be solved through community organizing and community partnerships with government or private agencies. We want to develop a groundwater supply. How do we choose which kind of well? of it. For this reason, simple, shallow wells where people draw water in buckets may often be better than costly deep wells that require pumps. Before digging a well make sure that the kind of well you dig is the best for everyone’s needs. How do you know if the water in a well is safe? Do people stand on the lip of the well or use unclean buckets when they draw water? What steps can the community take to improve scoop holes and water holes? Shallow hand-dug wells can provide good, safe water. But the water can dry up or be easily contaminated. During rainy periods, runoff water may drain into a water hole, carrying germs and other contamination. The muddy conditions around water holes make it easy for germs to collect on the feet of people or animals that use the water. Buckets and ropes around the rim of the well may also collect germs and can easily contaminate the water when they are lowered into the well. Making simple improvements can prevent contamination. One improvement is to ensure that only clean buckets and ropes are lowered into the water. Building up earth around the hole or lining the top with bricks or concrete rings will also make the water safer. Lining the hole has the additional benefit of making it less likely to dry up or collapse. Before drilling new wells or making costly improvements to water systems, consider making small improvements like these to make your water sources safer. Build stone steps into the water hole so people can draw water from the last step without getting wet. Always use the last dry step. Never wade into the water. Or turn the water hole into a well so people can draw water with a clean rope and bucket. The graphic below shows several ways of improving basic wells adn scoop holes. It is important to never drink directly from a water hole. Filtering the water and letting it settle will remove some germs. Our community had a tube well but the pump broke. What if we would like to build a new well? AAF has seen a lot of communities where boreholes have seized to work because expensive pumps that were installed have broken and can't be repaired due to their expensive repair costs. We would encourage the communities to follow the following procedures in building a new well. 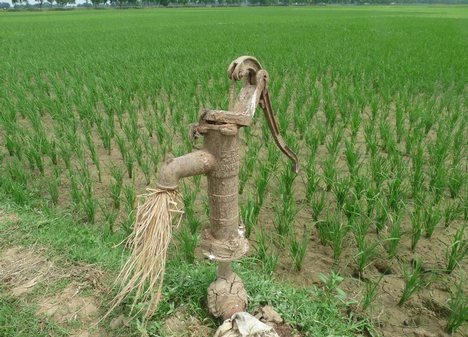 Many communities have had tube wells built for them by governments and international agencies. One reason for making these wells is to better protect the water from contamination by people and animals. But 4 to 5 years after they are drilled, many of these wells can no longer be used because the pumps break, spare parts are no longer available, or the people who can fix them are gone. This can lead to water insecurity. In some parts of Africa, tube wells are now being replaced by “protected family wells” that protect water quality and ensure water security. The best sign that there will be water is other wells nearby. But if they are deep boreholes this may mean the groundwater is too deep to get to by hand digging. Another good sign is the year-round presence of plants that need a lot of water to survive. Low areas are more likely to have water than higher ground. But if a well is dug in a low area it will need to be protected from rainwater runoff. How do you make a protected family well? A protected well has a lining, a concrete cover slab, a windlass, and a drainage platform. Each one of these things adds some measure of protection to the well. With all of them in place, and with careful handling of the water, a well can be considered very safe. Digging a well and making a lining is difficult and dangerous. It is best done by trained and experienced well diggers. Traditional wells often have no lining. In very firm soils, lining the well may seem unnecessary. But it is wise to line at least the top 11⁄2 to 2 meters below ground to prevent the side walls from collapsing. If the entire well is lined, it will make the water source more dependable, but it will be more difficult to dig the well deeper at a later time. A well can be lined with stones or rocks, with fired bricks, or with concrete. Once a well has been lined, the next stage of protection is fitting a concrete cover slab. The cover helps prevent polluted wastewater and other objects from falling into the well. It also makes the well safer for children and provides a clean resting place for buckets as people collect water. The cover should fit neatly over the upper well lining. Clear a flat place to pour a concrete slab and mark out a circle the size of the cover slab to fit the well. Place a ring of bricks around the marked circle. This ring is the slab mold. Leave a hole in the slab for a bucket to pass through or a pump to be fitted. The size of the hole depends on the kind of pump or bucket used, but generally the hole should be large enough for a 10 liter bucket. A can large enough for a bucket to pass through can be used to form the hole. Place reinforcing wire (3 millimeter) within the slab mold to form a grid with spaces 10 centimeters apart. Remove the reinforcing wire grid, and make a concrete mix of 3 parts gravel, 2 parts river sand, and 1 part cement. If stones are not available, use 4 parts river sand and I part cement. Pour concrete in the mold, half way to the top. Place the wire grid on top of the wet concrete. Add the remaining concrete and level with a piece of wood. Let the slab cure for 1 hour. Remove the bucket hole mold, and fill the central hole with wet sand. Replace the mold on top of the sand and place a ring of bricks around it, leaving 75 millimeters of space between the bricks and the mold. Fill the space between the bricks and the mold with concrete, and let it cure for an hour. After an hour, remove the bricks and the tin mold and shape the protective collar. For the collar to give the best protection, a tin cover should fit snugly over it. Let the completed slab cure for at least 3 days, keeping it wet the entire time. After it has dried for 7 days or so, place 4 blocks of wood 1 or 2 inches high under the 4 sides of the slab to raise it off the ground. Then dance on it! from cracking in the sun. A windlass is a shaft fitted with a handle that makes raising the bucket easier and provides a place to wrap the bucket chain or rope. If a pump is fitted to the well later, the windlass can easily be removed. Attach a durable bucket to the end of the chain or rope. Chain is best because fewer germs will grow on it, but it is costly. Rope is less costly and can be replaced easily if it breaks. Metal buckets will last longer than plastic ones. Durable buckets can be made from used tires and inner tubes. The drainage platform carries wastewater and runoff away from the well to a drainage area slightly downhill, to prevent the area around the well from getting muddy and breeding germs and insects. Germs can grow in cracks, so it is important to ensure that the platform is well made. Pour concrete to a depth of 75 millimeters, with a raised outer rim 150 millimeters high. The entire platform and rim should be reinforced with 3 mm wire to prevent it from cracking. Well water is easily contaminated when dirty buckets and dirty ropes are lowered into the water. Keep one bucket attached to the well and use it to fill other containers. This will ensure the well water stays clean. Providing a way to wash hands before collecting water will also prevent contamination. Hang the bucket on the handle of the windlass. Keep the well cover in place. Always use the same bucket in the well. Keep the platform and runoff clean. Keep the bucket chain or rope wrapped around the windlass. Grease the handle bearing often for ease of use. Do not let children play with the well or pump. A fence can keep animals out. To take advantage of the water that runs off, plant a tree or vegetable garden where the water drains. If you cannot plant a tree or garden, make a hollow in the ground filled with rocks or gravel for the water to seep into. This will also help prevent mosquito breeding.